One or more printers could not be reached due to permissions or other error: Error Code 1801. The ability to remotely access print information from servers running 2008R2 or 2012. When trying to release a print job from another print server, inability to do so. Due to a known limitation in IIS after certain windows update packages, the ability to remotely access print information on servers running 2008R2 / 2012 is not an available feature. There is a workaround that can be put in place to solve this issue by explicitly specifying what user is used to reach remote printers. 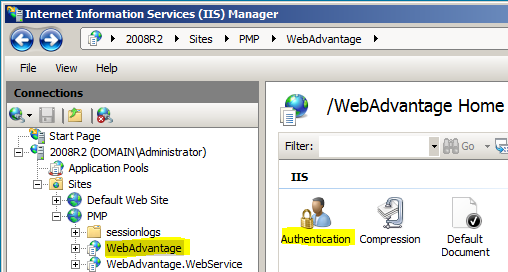 This will allow WebAdvantage to read the status of printers on a remote print server by using an encrypted username and password stored within Web.Configfile. Following all of the steps will ensure this user is added, and its password is encrypted. Launch Internet Information Services (IIS) Manager. Go to Start> Administrative Tools> Internet Information Services (IIS) Manager. 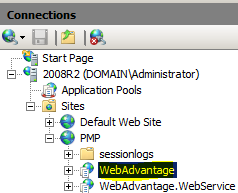 Expand top level site [ServerName] (DomainAdministrator) then expand Sites and choose the PMP site, expand that and choose WebAdvantage(do not select WebAdvantage.Webservice as this is applicable to iPad App and is not of importance for the change). Then Click OK. Next Close out of Internet Information Services (IIS). You have successfully changed IIS to read the status of the printers on a remote print server. From the Command Prompt run the following command. The Encrypt method ensures the password is not visible as plain text but as an encrypted string once set. This completes configuring ASP.NET Impersonation Settings, the below step is only needed if changes need to be made. The Decrypt method allows you to remove the encryption thus allowing you to reconfigure or make changes to ASP.NET Impersonation Settings (this includes changing username and password that was configured).